The world watched closely the US presidential election last year, which drew attention over the possibility of the first female president versus “the outsider” with no prior political experience. In this regard, gender, ethnicity, and immigration became focal points, and a fierce competition over “American values” broke out in the campaign. Since the inauguration, the Trump administration announced a number of policies that rejected diversity in line with his “America First” campaign promises. Who supported Donald Trump and why? Why did the “America’s First Female Presidential Candidate” fail? How should we interpret Trump administration’s first political moves? The purpose of the symposium is to understand the results of the recent presidential election as well as the social implications of Trump’s policies from the perspective of gender and diversity. 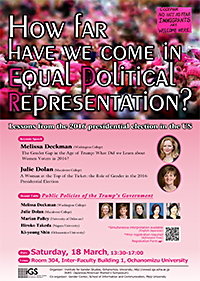 In the first session of the symposium, we invite experts on American politics to give keynote speeches, and in the second session we organize a roundtable consisting of gender and politics scholars and keynote speakers, and ask them to discuss issues relevant to Trump’s policies. We look forward to participation from researchers interested in American politics, as well as the support and participation of the general public.